In one of my previous posts about adding transitional style to any room, one of the five main elements I addressed was texture. Texture is essential to adding visual interest to a room of any style - not just transitional. It can be achieved by varying textures of fabrics on throw pillows, curtains, rugs, blankets, etc. What I didn’t mention was adding texture to your walls! Think outside the box - this isn’t simply the texture already on your drywall - it’s adding architectural details to your wall. This can be done in so many ways. Shiplap and board and batten are crazy popular right now - but you’ll also find brick and other natural stone, wood beams, stucco, tile from floor to ceiling… just to name a few. If you take the time to look, you’ll notice these details are in almost every picture you look at in a home decor magazine or catalogue. Rarely do you ever see a room that simply has painted walls. These architectural details are hardly ever the main focal point of the room, so often times they’re overlooked. However, if you start imagining the room without those subtle (or not so subtle) architectural details, you’ll realize that the entire look and feel of the room would be dramatically different… and probably very boring. Adding architectural details to a room is an instant way to elevate its style. Let me highlight a few of my favorites for you and see if you agree. 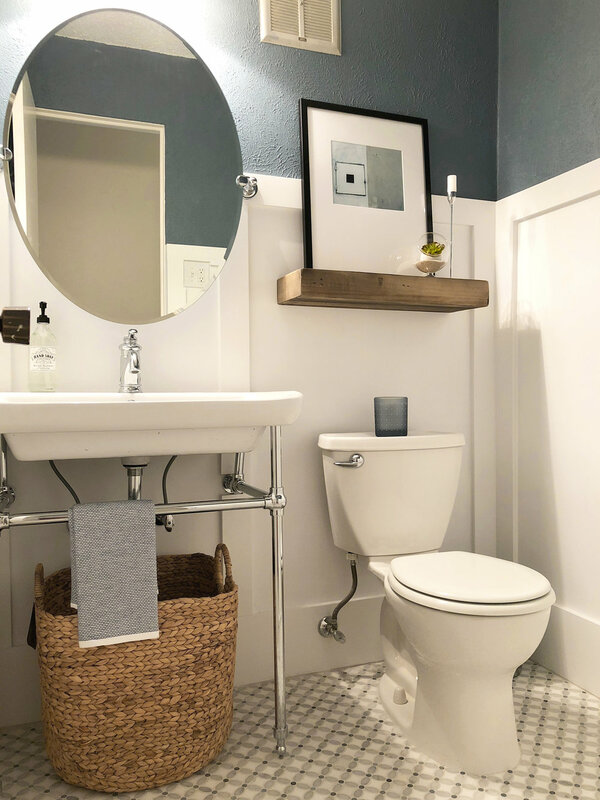 SHIPLAP - Shiplap is a huge trend in the design world right now thanks to Joanna Gaines of Fixer Upper. Typically, shiplap is made up of strips of wood laid horizontally on a wall from floor to ceiling and is painted white. Obviously there are a zillion variations of this - vertical planks, shiplap painted other than white, shiplap that only extends a portion of the wall. It also looks great in many different decor styles - from modern to farmhouse and just about everything in between. 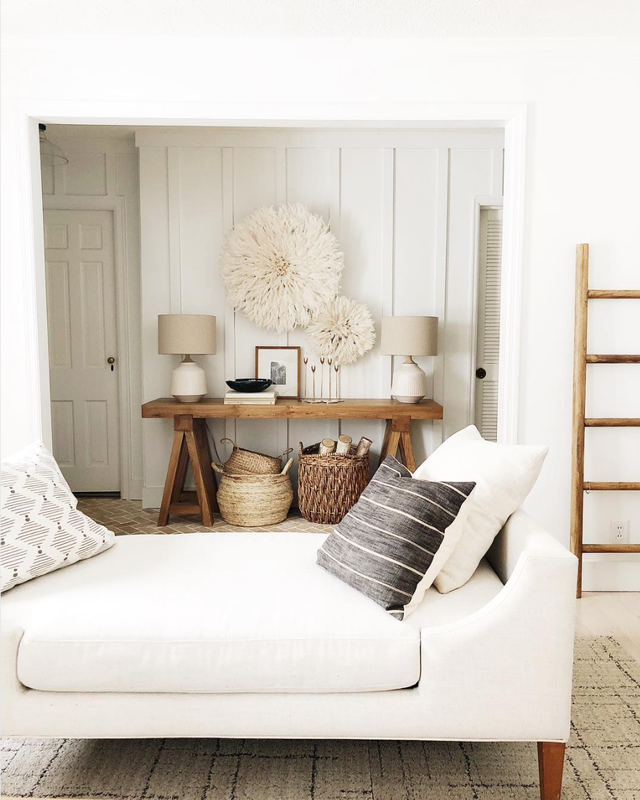 Along with the endless variations of shiplap come endless tutorials on Pinterest on materials that can be used to create the look and endless ways to install it. 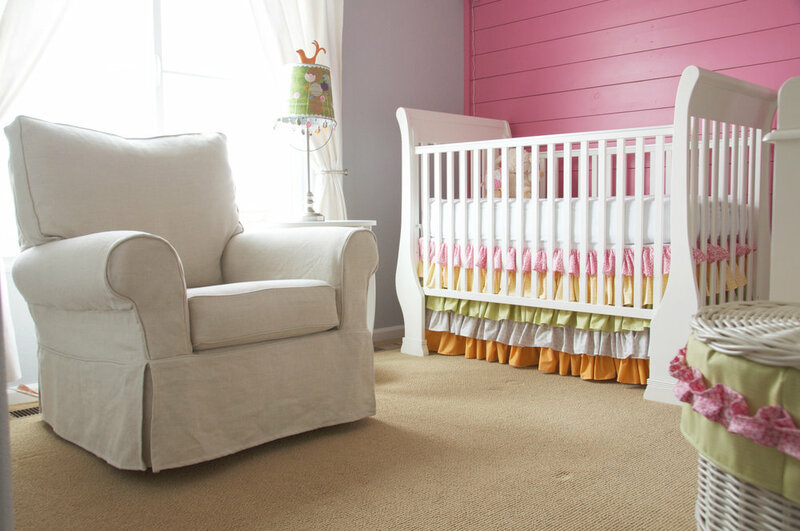 We put shiplap in my daughter’s nursery several years ago (before anyone had ever heard of Joanna Gaine’s, thank you very much - ha!). I loved the style it added to that house so it was a ‘must-have’ in our current house. We have it wrapping around three walls on our main level of this house, and if my hubs would just agree to it, we’d have it on many more! I love the detail it adds to our entryway and kitchen. BOARD AND BATTEN - Another similar architectural detail that can be added to your wall is board and batten. The term is used because the look is created with flat boards placed against the wall and batten (small strips of wood) used to cover the seams. The layout is only limited to your imagination, but they are generally used on the bottom portion of your wall, but there are other really beautiful ways to use it as well - one way being a grid on a focal wall. Board and batten adds a level of craftsmanship to a space that is hard to beat. WAINSCOTING and BEADBOARD - These are two words that are used interchangeable, but technically are not the same thing. Feel free to google the difference if you care to know, but for the sake of this post, I’m going to count them as the same thing because they are so similar in looks from afar. They both come in large, grooved sheets and need to be trimmed out on the top and bottom. These are probably one of my least favorite ways of adding architectural detail right now simply because they were in the height of their glory years ago and now wider planks of wood seem to steal the show. However, I DO still really like the looks of them on a ceiling! Here are a couple of my examples I came across that I do really like. BRICK and NATURAL STONE - Brick and natural stone seem to be timeless. Anytime you can bring nature indoors it seems to bring warmth and balance to a room. I am a long time lover of brick both outside and inside the house. We had brick installed in our previous kitchen and it quickly became one of my favorite features of the house and it did a great job of making our house feel different from every other cookie-cutter house on the block. 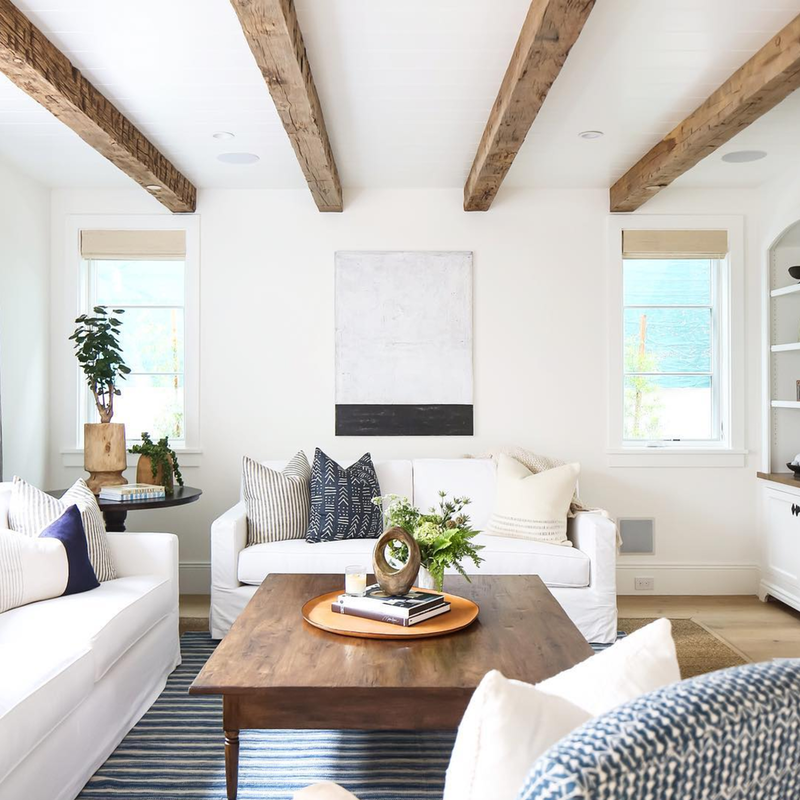 WOOD BEAMS - This is a trend that seems to come and go, but right now it’s definitely the thing. This architectural detail seems to be a bit more specific in the ways that it can be pulled off well. Most of the time they are used in larger rooms with tall ceilings. I’m sure they can be successfully pulled off in smaller rooms, but it certainly could make a small room feel even smaller since it visually lowers the ceiling by several inches. When done right, however, they are stunning! So, do I have you convinced? Architectural details are subtle but are one of the things that can take a room from blah to totally unique and beautiful. They help to define a space and add texture and character to enhance the overall aesthetic of a room... and give your other beautiful pieces a chance to shine in a way that they wouldn’t have otherwise.